Don’t guess when it comes to performance…a RegEx story. I’ve blogged before about how some things are different in the cloud, namely Azure. 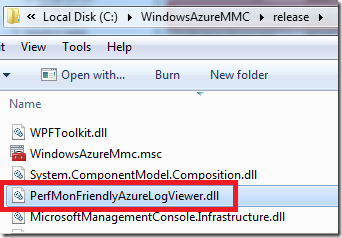 That post dealt with finding out why your Azure Role crashed by using some of the logging facilities and storage available in Azure. That’s kind of a worst case scenario, though. Often, you’ll just want to gauge the health of your application. 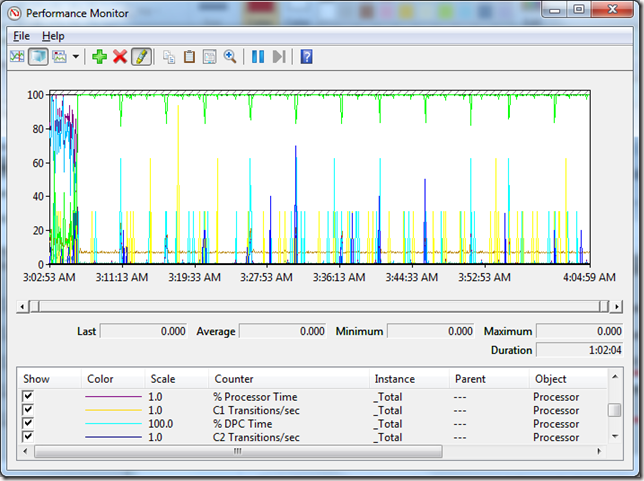 In the non-cloud world, you’d just use the Windows Performance Monitor to capture performance counters that tell you things like your CPU utilization, memory usage, request execution time, etc. All of these counters are great to determine your overall application and server health as well as helping you troubleshoot problems that may have arisen with your application. I’m often surprised at how many developers have never used Perfmon before or think that it is purely a task that administrators need to care about. 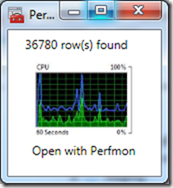 Performance is everyone’s responsibility and a tool like Perfmon is invaluable if you need to gain an accurate understanding of your application’s performance. 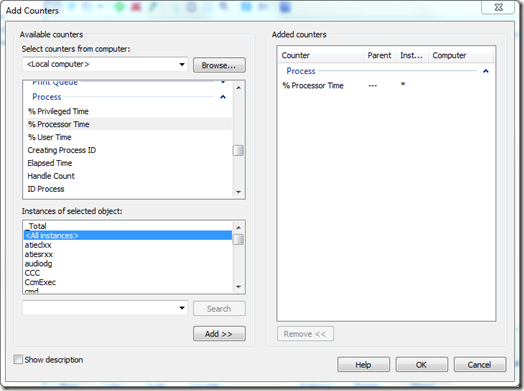 In the Azure world, you can add counters to be collected in a variety of ways. A popular way is just to add the counters you want in your OnStart() event. // Add counter(s) to collect. // Set transfer period and filter. // Start logging, using the connection string in your config file. This gets the job done quite nicely and even though we’re sampling our performance counter every 5 seconds, the data won’t get written to our persistent storage until we hit the 5 minute mark. For example, using the Azure Management Tool, you can navigate to the Diagnostics/Analysis section to view the performance monitor counters you stored. The BLG can be used in a variety of applications. For example, you can use it with the great PAL tool. All of the counters will appear in the graph by default. Depending upon the amount of data you’re capturing, this could give you data overload. Just something to be aware of. Many times, when I work with a customer, it’s because they’ve tried to accomplish something and need a little extra help. 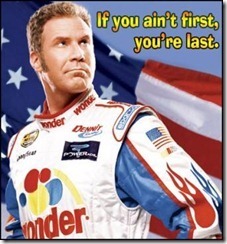 Often, this falls into the application optimization area. For example, a few years ago, I had a customer that was developing a rather sophisticated SharePoint workflow that had some custom code that would process and merge two Excel spreadsheets together. They were using Excel 2007 so their merging was being done using the excellent Open XML SDK. To their credit, the application did what it needed to do – but it took about an hour to process these spreadsheets. The developers on the project knew about the performance problems but as so often happens, they thought they knew where the bottlenecks were and how they should approach optimizing it. 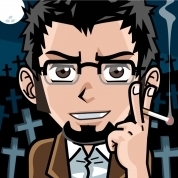 So, they started injecting some tracing into their code and worked hard to optimize this lengthy process. After a while, though, they had only shaved a few seconds off of that 60 minute time and while they did show some improvement – they knew they needed to get the processing done even faster for this to become a viable solution for their organization. So, they sent me a simple repro of the code and together in just a few short days, we were able to get the processing from 60 minutes to under a minute. That’s a BIG win. Big like the Titanic big. It sounds good in-theory, right? You wrote the code, so you should know how to improve it and really, what’s a tool going to tell you that you don’t already know? In truth, it can tell you quite a bit. In other situations, the developers will add some instrumentation (via tracing/debugging statements) to what they perceive as the critical code paths and the resultant timing points to one area when the problem really resides in a completely different section of code. That’s right, folks, your tracing statements may be lying to you. So what’s a developer to do? Well, use the tools, of course – the right tool for the right job, as they say. Let me expand upon that in the context of some code that yours truly wrote a little while ago. This is clearly a problem Now, the question is why? The red text are the keys and the highlighted blue text is the string between them. The idea for the above GetValue(…) method was actually provided by a fellow PFE engineer, Richard Lang during a late night chat session. So now it takes just about a second to process these records. Considering it’s processing over 10,000 event log messages, I’d say this is acceptable performance, for now. I just want to say a few things real quick. RegEx is not inherently evil. It is still one of the fastest and easiest methods to consume and parse data. You should not feel the need to go back to your own applications that are working just fine and refactor all of your code to strip out the RegEx expressions. It just so happens that sometimes too much of a good thing can be bad for your health. In our case, with over 10,000 RegEx.Match(…) calls in rapid succession, the RegEx appeared to be our bottleneck. This may or may not be the root cause of your own performance problems. The key takeaway from this blog entry should be that you should NOT guess when it comes to optimizing code paths. Instead, you should use the tools available at your disposal to find the bottleneck. Create a new WCF Service (in the same category as WebSite). Add a bunch of new “WCF Service” classes (files with an extension of “.SVC”). Write some code to call out to your existing class library from the WCF Service. Then, I’ll discuss additional options for debugging your new service. This is just a simple little business logic class that exposes two public methods – GetName and GetEmpInformation. So, let’s say we wanted to make this class accessible as a WCF service. 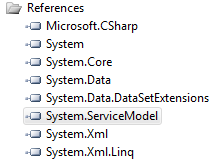 The first thing we need to do is add a reference to the .NET 4 version of System.ServiceModel in our Class Library project. 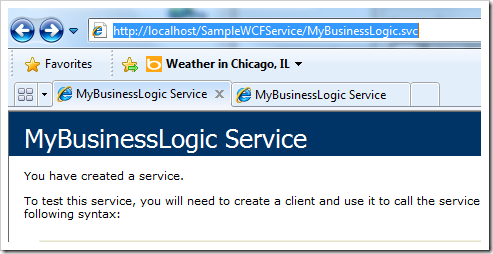 ServiceContract – This decorates our class and tells .NET that we have a WCF Service. 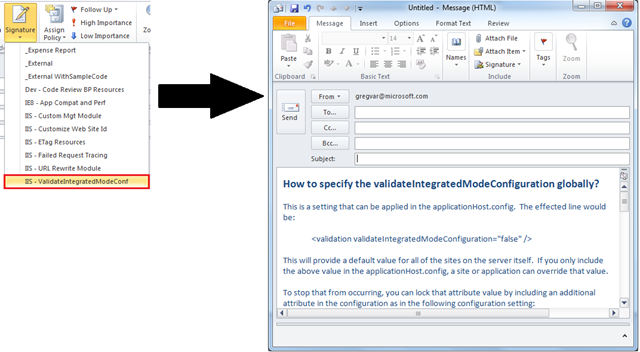 OperationContract – This decorates our methods and tells .NET which methods/functions we want to expose in our service. And really that’s all you have to do from the code side. That’s it. 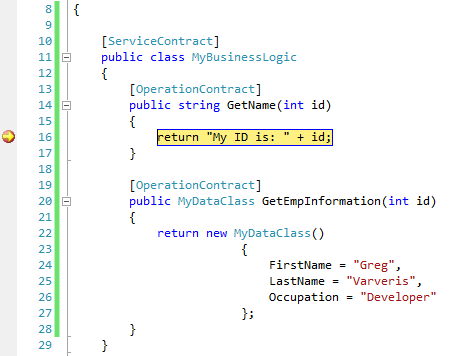 In the first snippet, we are adding a relative address of “MyBusinessLogic.svc” which will point to our MyBusinessLogic class we defined above. The second section along the bottom is just to enable the service metadata. Now that we have our minuscule configuration and trivial decorations to our class, we need to host our service somewhere. For this, we’ll just use IIS with an ASP.NET 4.0 application pool. The structure of this folder will need to have the assemblies in a “bin” folder and the web.config in the root. Attach to the instance of w3wp hosting your WCF service. Cassini…errr, the ASP.NET Development Server. I personally prefer either options 2 or 3 as it provides that seamless debugging experience we all crave where we just hit the “Green Arrow” to start the debugging session. With either option you select, we’ll need to make one or two minor configuration changes. First, we’ll need to tell the solution to start our process. 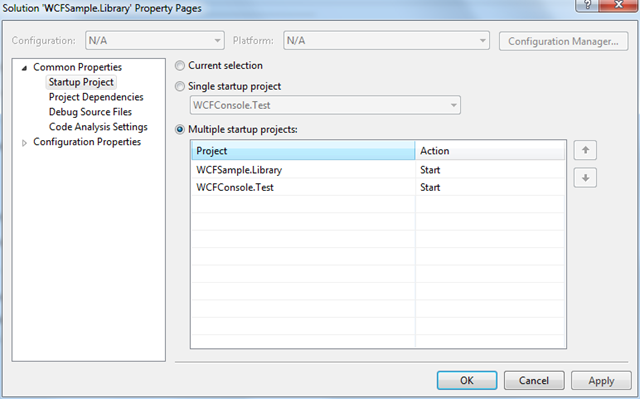 For this, you can right-click on your solution file in the Solution explorer and select “Properties”. In this window, you’ll need to select the Multiple Startup Projects radio button and set both of your projects (the Client and the Service) to the “Start” option. if exist "$(TargetDir)bin" del /q "$(TargetDir)bin\*. *"
if not exist "$(TargetDir)bin" mkdir "$(TargetDir)bin"
/path:"<path to folder containing bin & web.config>"